The fabulous Petrea Burchard over at Pasadena Daily Photo is holding a contest in support of the much-anticipated publication of her novel, Camelot & Vine. The contest is called Camelot Where You Are, the idea being that Camelot is everywhere. Tommy and I like a contest just as much as the next guy, but where were we to find a Camelot by us? Well, turns out there's one near my old neighborhood at Camelot Kids Preschool in Silver Lake. The photo above is not the one we entered in the contest. Visit Pasadena Daily Photo (Wednesday, October 24) to see it. 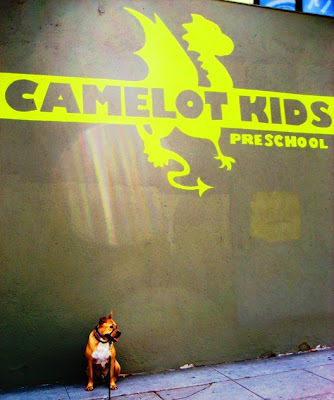 Then go back over the weekend to vote for your favorite Camelot photo of the week. I won't tell you how to cast your vote (that's downright un-American), but let's get real: how could any Camelot top the Camelot where Tommy is?! Love this photo, Susan! Tommy is sitting so politely. I look forward to seeing your other photo tomorrow!! Thanks, Adele! Tommy has his moments. Tomorrow's photo is pretty much the same. More Tommy! How wonderful of you! Thank you! Boz and I are excited to host your photo tomorrow (10/24/12). Tommy has already posed on my blog, he's such a pro. Thank you, Petrea! I'm having fun. Tommy, the old pro that he is, takes it all in stride. Good point. Eager to see your submission. Thank you, KBF and Jean! I'm glad you're not offended by the blatant campaigning for Tommy. That was known as Camelot!" Tommy has more than a brief shining moment. He is forever Camelot! Ah, Liz. I only recognize that quote from when it was posted on PDP as part of this contest. But you know all about Camelot! Tommy is my once and future king!!! He is sooo funny, I adore him!!! How an anyone compete with Mr Charisma? Hiker, I had to brush up on the Arthurian legend to understand your comment. Yep, you've got Tommy's number, that's for sure. Lynnie and sonia, on the other hand, you guys are putty in his paws. Yeah, I know. So am I.
Margaret, I hear Mr. Charisma will have some tough competition tomorrow. Ms. Charismas, perhaps? Sounds like KB studied English, or literature. Cafe, Hiker definitely knows her literature. Thanks, Nick. Life is good, just a little too busy. Hope all's well with you, too. i read recently how one website judged silver lake to be the hippest area in the USA. i'm sure that will make some happy & upset others! as for me, i don't follow trends or care whether i'm hip or not. Cafe, the fact that you don't care whether you're hip makes you the hippest dog in town. PA, Tommy and I thank you for your vote! I can't wait to flip through the pages of our prize, "Camelot & Vine."